Trainers:T. Poog, H. Gillard, George Harrison. 23 players took part in the final series. Seems to be 23 players plus officals in this picture. Can anyone name them? Charlie Davey is the tallest back row, Maybe Harry Vallence is back row 5 from Davey on the right. Jimmy Goonan in suit next to the lady. Could be Frank Brody reserves secretary front row far left. Beasy, Bell, Blackmore, Brewis, Brew, Carter, Collins, Connell, Donohue, Duncan, Dunn, Gilby, S. Irwin, Kelly, McSwain, Morrissey, Mullens, Outram, Robertson, Styles, Vallence, Watson. Horrie Clover (coach) had said he has no desire to play, but by late April he had changed his mind. In 1927, Carlton won our second Reserves Premiership in a row. Goalkickers: Outram (5), Vallence (2), Davey (1), Stone (1), Skehan (1), Mount (1) and Robertson (1). Best: Kelleher, Davey, Mount, Robertson, Fitzgerald, Outram, Vallence and Skehan. 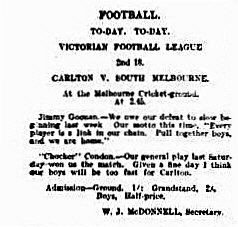 1927 September 03: "Success of Carlton's Second Eighteen Due to Coaching and Organisation." W. S. "Jumbo" Sharland of the Sporting Globe looks at Carlton's winning reserves teams. The Carlton Football club decided to appoint the committee of the Second Eighteen or Reserves. A scrambling type of game. South lead by 2 points at quarter time, Carlton then lead throughout and had an 8 point advantage at the last beak, going on to win by 26 points. Before the game the 1926 Reserves premiership flag was unfurled by the wife of the president, Mrs. Reyment. The visitors got off to a good start to lead 4.3 - 1.0 at quarter time. The Blues hit back to trail by 4 points at half time. A very even second half followed. Recruit C. Davey from Chelsea was put on the ball and his high marking and play around the ground was a feature of the remaining quarters. The lead changed hands with the Blues winning by 6 points. An even game for three quarters with the scores being level at the last break. Early in the final term the Blues kicked 3 quick goals to give the visitors a commanding lead. Geelong led at the first break due to Carlton playing the man instead of the ball. The coach got stuck into the Carlton players and at half time scores were level. The Blues got on top and in the last term and outclassed the visitors. 18 year old Charlie Davey showed all the poise of a much more experienced player. After this match the Carlton Reserve team travelled to Euroa to play a match there. Monday's Argus said it was about the 20th. game in a row the Blues had won. A even game throughout with the visitors holding a 3 point advantage at half time. At three quarter time the Magpies had extended the lead to 15 points. Carlton goaled immediately at the start of the final term. The Blues then overpowered Collingwood and were led brilliantly by J. Goonan. Carlton Reserves secretary Mr. Brody organized a special train to take their supporters to Geelong. Carlton Reserves have won their last 24 games, the last 10 matches of season 1926 and the first 14 of this season. Attendance; It was larger than normal and the Geelong Advertiser estimated a crowd of 1,500. Geelong won the toss and kicked with the aid of the wind. In the evening the Carlton Reserves' committee entertained players, officials, and supporters at the Prince of Wales Hotel before their 8.30pm train left for Melbourne. Carlton lost by 41 points. Best; Goonan, Davey, Kennedy, Davies, Outram, Parkhill, Lewshing. Attendance; 8,349 (record) Gate takings £300 also a record. Carlton captain Jimmy Goonan was injured and did not play. The Blues were on the back foot from the opening bounce. Collingwood were contantly attacking, were quicker and held sway in the air. The Carlton defenders had to work over time with Denis Kelleher, Robbins, Bill Downie and Parkhill the best of them. At half time the Blues were 19 points in arrears. On resumption Collingwood goaled and and it looked grim for the Blues. However once again the defence stood up and the 'Woods only managed 5 behinds for the rest of the third term. Carlton very rarely were able to get the ball into their forward line. Twice they went forward, both times through the good play of Frank Mount which resulted in goals to Jack Way and Harry Vallence. At three quarter time the Blues trailled by 18 points. Charlie Davey was swung into the ruck and immediately started taking marks around the ground. When both Allan Skehan and George Styles goaled the crowd was up on its feet. Collingwood were tiring and Denis Kelleher repulsed many of their attacks. Carlton crept closer through adding several behinds. Two points separated the teams when Frank Mount brilliantly ran down from the wing and threaded an angled goal to give the Blues the lead with six minutes to go. Both sides were trying to attack when Parkhill pulled down a mark in a pack of players in front of the goals. Parkhill kicked truly to give the Blues a 10 point win. Goals; Vallence 2, Way 2, Skehan 2, Styles, Mount, Parkhill. Carlton played South Melbourne in the Preliminary Final on the M.C.G. South had use of the strong wind in the first quarter. Driving rain midway through the second term turned the ground into a quagmire. Carlton did most of the attacking but they could not break through. The sodden, leaden ball made marking impossible and 'soccering' was the order of the day. South led by 15 points at the last change. If Carlton had won the match they would have been premiers. However as they lost, they had the right to challenge South Melbourne because the Blues had finished on top of the ladder at the end of the home and away season. Carlton lost by 7 points. Best; Vallence (half forward), Mount (wing), Goonan (centre), Kelleher (half back), Skehan (following). Page last modified on Wednesday 30 of January, 2019 09:31:35 AEDT by blueycarlton.